KNOM has won the 2009 Gabriel Religious Radio Station of the Year Award! It’s our 17th top Gabriel, and the 14th in a row. Once again, please pat yourself on the back for making our award-winning work possible! By the time you read this, Nome will probably have seen its first frost, and a bit of snow, as well. As we slip into the long winter, we pause to thank you for your generosity and your prayers. It is you who makes our mission successful. It is you who brings the Mass, the Rosary, timely news, education and positive, friendly companionship to remote families throughout 100,000 miles of road-less western Alaska. In gratitude, we pray every day for you, for your intentions and for those whom you love. May God bless you abundantly! HAPPY RETURN: (left) From 1989 to 1991, KNOM volunteer Ross Tozzi worshipped in Nome’s St. Joseph parish. Today, Father Ross Tozzi is its pastor. He was appointed to the post as of twelve noon July 1. That day, he offered Mass starting at 12:01. 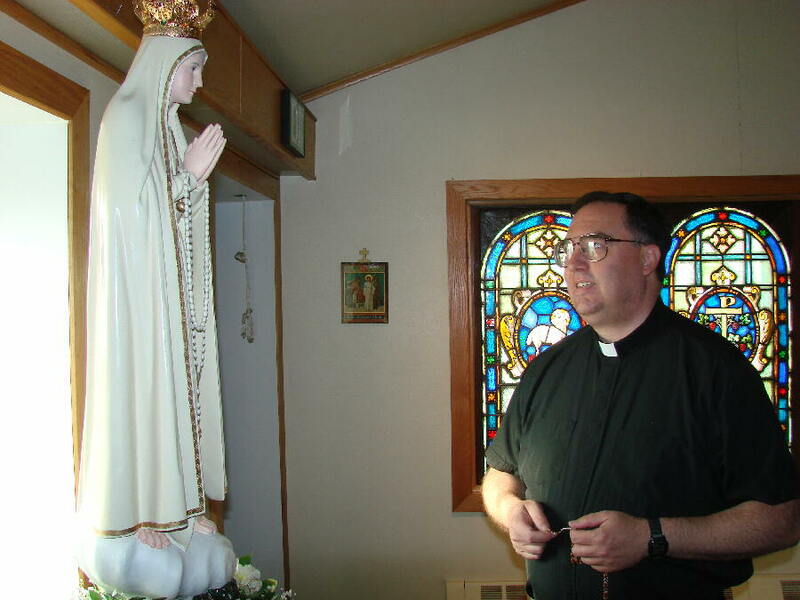 Here, he prays before a statue of Our Lady of Fatima. 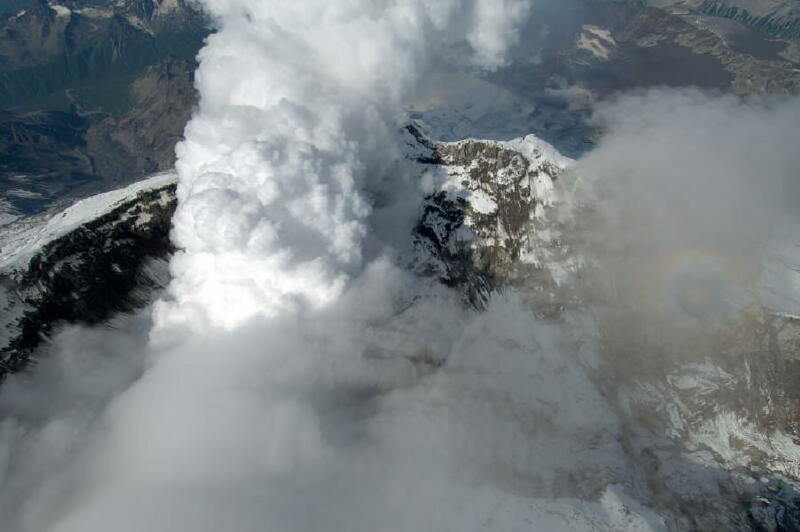 NO NEWS IS GOOD NEWS: Earlier this year, we wrote you that Alaska’s Mount Redoubt volcano had erupted, that its ash was disrupting air travel, and that the eruption was expected to continue intermittently for many months. The good news is that despite forecasts, the mountain eventually quieted. We are greatly relieved. 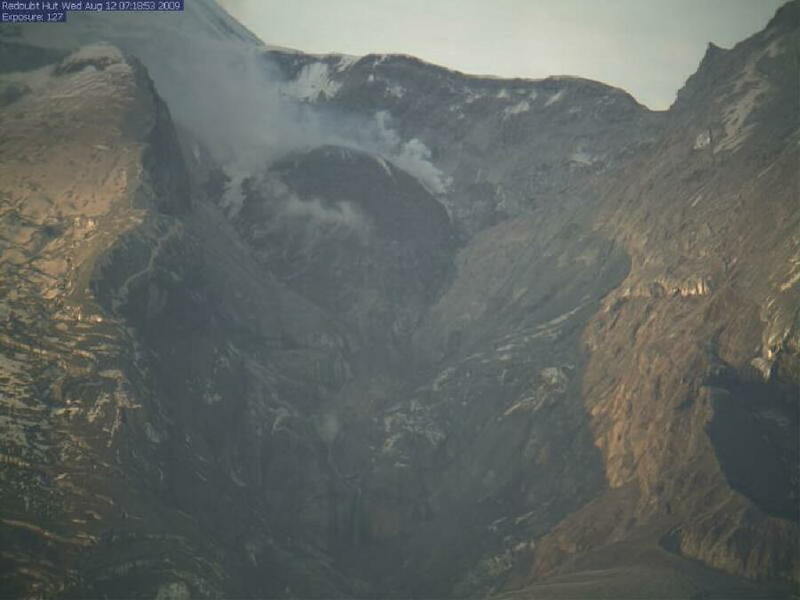 (Top left) In this image taken August 12, the dark round lava dome at top center continues to periodically and harmlessly sputter vapor. (left) Mount Redoubt vents steam on July 2. Please consider adding the KNOM radio mission to your will. We prayerfully place all bequests into a fund that is used only for future major improvements, and to help the mission during emergencies. Thank you! INSPIRATIONAL SPOT: Little things in life are important. It isn’t the mountains that wear me out, it’s the tiny pebble in my shoe. How about you? Do my very small acts of kindness make you just as happy as your thoughtful acts make me? INSPIRATIONAL SPOT: Sometimes it seems that You are so far away, Lord. Is it I who has created this distance between us? Help me to love You back into my daily schedule and once again open my heart to Your Presence. 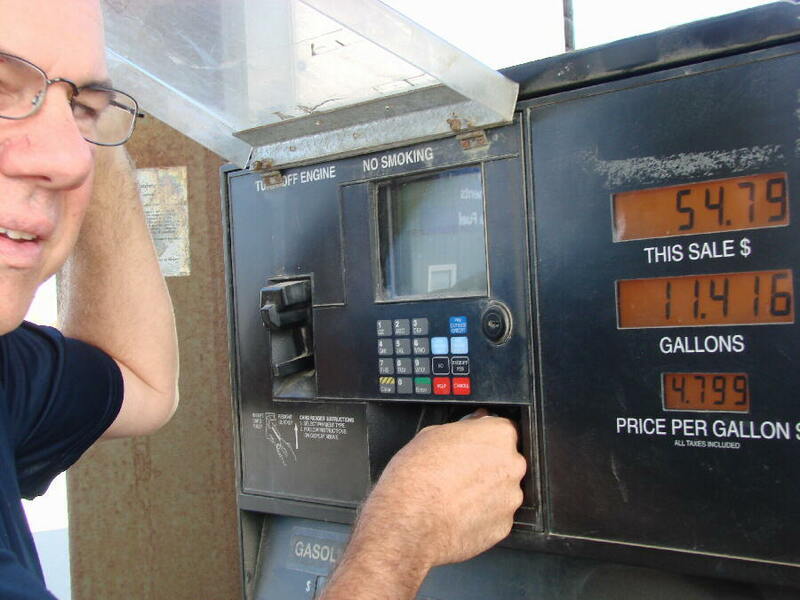 ONE UNLUCKY DAY: (left) KNOM general manager Ric Schmidt takes the receipt, after topping off the tank of KNOM’s car. The price of gasoline is fixed on the day of its annual delivery to Nome, and the most recent oceangoing delivery was a day last autumn when oil prices were at all-time highs. Since consumption is down, the cost will remain high until the supply is replaced. KA-BANG! Because of its relatively low summer temperatures, Nome rarely sees a thunderstorm, perhaps every five or ten years. We did experience one recently, and our AM tower took at least one lightning strike. Thanks to careful planning in the design of the building and its grounding system, the transmitter just winked off for a fraction of a second before returning to life. We remember with fondness the many good people who helped finance the installation’s construction in 1996 and 1997, and keep them in our prayers. 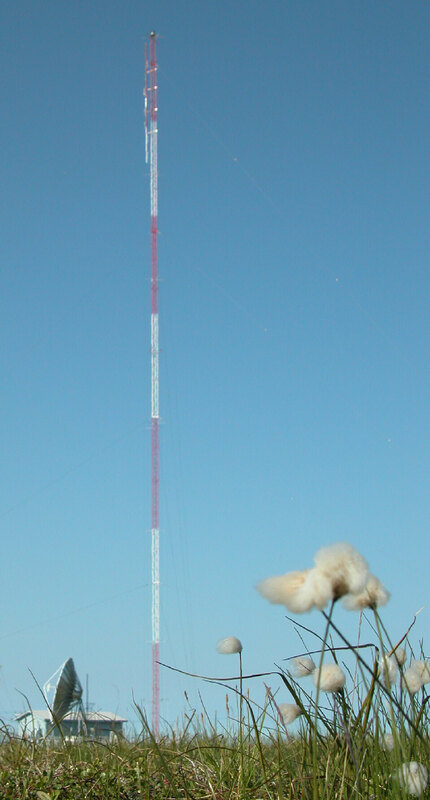 (Left) The KNOM AM tower enjoys better weather, in this image from 2005. In the foreground, you can see "Alaska cotton" growing on the tundra. MORE WEATHER: August 4, a woman flying to Nome photographed a waterspout in the Bering Sea, about 130 miles east of Nome. It's the first time anyone can remember hearing of one. HISTORY-MAKING VOWS: (left) There are many married couples who met because they volunteered for KNOM, among them Ric (1984-85) and Lynette (1982-85) Schmidt and Tom (1970-73) and Florence (1975-76) Busch. 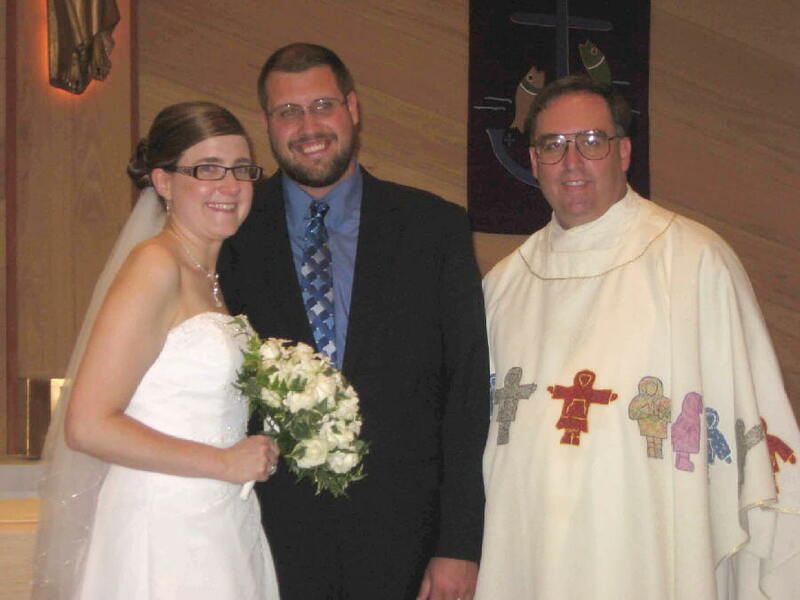 This past summer, the wedding was in Nome, uniting former volunteers Liz Recchia (2004-06) and Eric Guthier (2005-06). It was officiated by Fr. Ross Tozzi (1989-1991), wearing a chasuble sewn by Lynette. We wish the couple many blessings. OCCASIONAL PERKS: If you're a KNOM volunteer, you work hard. When fellow staff are traveling, you may have to work six or seven days a week. You're isolated, 500 miles from the North American road system, thousands of miles from friends and family. Because of the expense of food, you're probably eating a lot fewer fresh fruits and vegetables than you've been accustomed to enjoying. In summer, you endure days of wind and fog. In winter, it's nasty blizzards, sometimes one after another for weeks at a time. However, there are benefits when the weather cooperates. 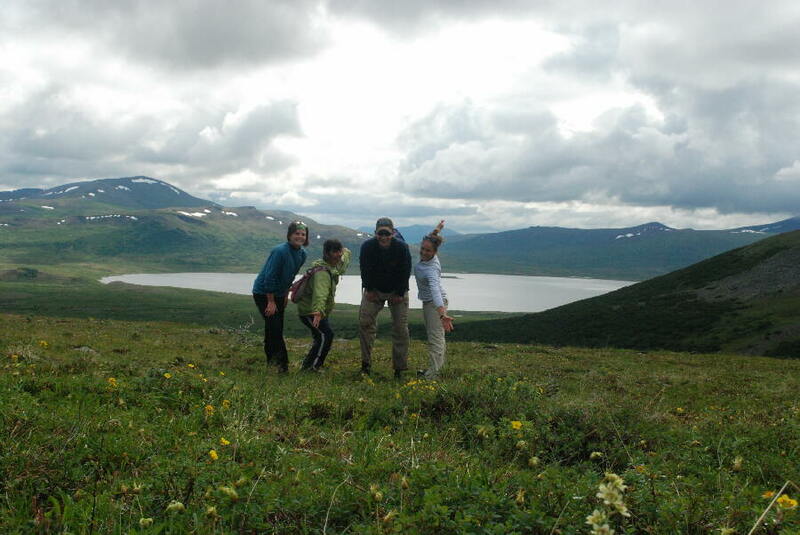 In the top image, from left, volunteer Leah Radde, friend Abby Huggins, and volunteers Jesse Zink and Danielle Sylvester take in the wilderness Alaska scenery at Salmon Lake, 30 miles north of Nome. 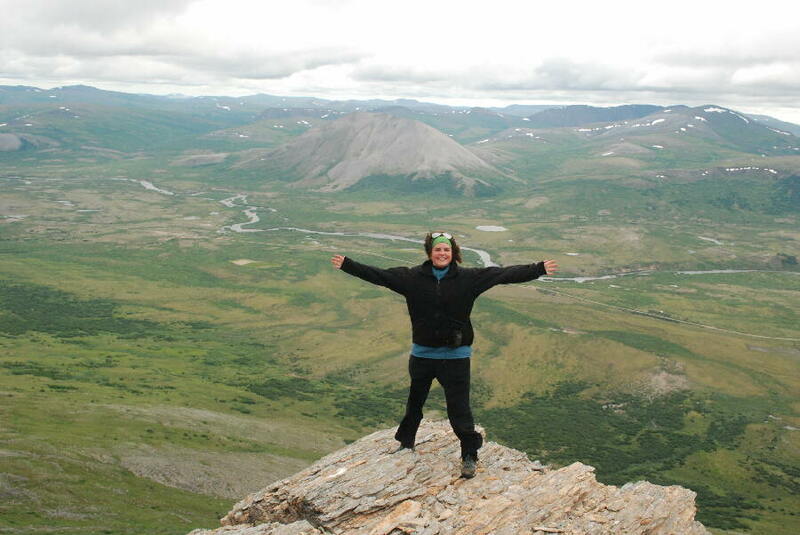 In the second picture, Leah rejoices to have conquered King Mountain, with the Nome River valley in the background. How far do you reach? KNOM has at least one daily listener who lives near the Canadian border, more than 700 miles away. We have listeners as far as a thousand miles into Russia, and our call-in programs have received calls from Alaskan villages as far as 900 miles, about the distance between Boston, Massachusetts and Atlanta, Georgia. KNOM’s primary coverage area is 100,000 square land miles surrounding Nome, including Alaska’s vast west coast, several islands, and the Yukon River delta and drainages. How much does it cost to send me the Nome Static? $5.58 a year, or 43� per issue. We are happy to send it to anyone who is interested, regardless of the ability to give. We do, however, request prayers for our work and the isolated people whom we serve. INSPIRATIONAL SPOT: Jesus was born in a borrowed manger. He preached from a borrowed boat, entered Jerusalem on a borrowed donkey, ate the Last Supper in a borrowed room, and finally, was buried in a borrowed tomb. Does that tell us something about our tendency to own so many things and make them so important in our lives? WELCOME! Meet KNOM’s newest, volunteer music director Leah Radde (left). From Cologne, Minnesota, Leah graduated from Dordt College in Sioux Center, Iowa with a degree in business administration, minoring in music performance (she plays clarinet). Leah heard about KNOM accidentally, from former volunteer Jesse Zink’s Aunt Judi. “I got really excited about it,” she says, so eager that she forced herself to tone down the enthusiasm in case she was not accepted. “I would have been devastated,” she says. Her arrival was a milestone, though we didn’t realize it until a few weeks later. 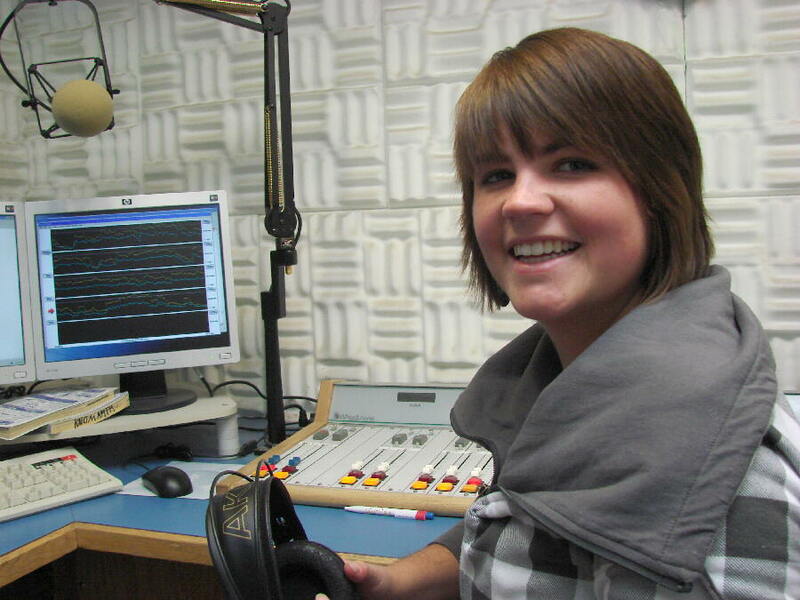 Leah is the 300th person to volunteer for KNOM since the drive to establish a Nome Catholic radio station began in 1966. 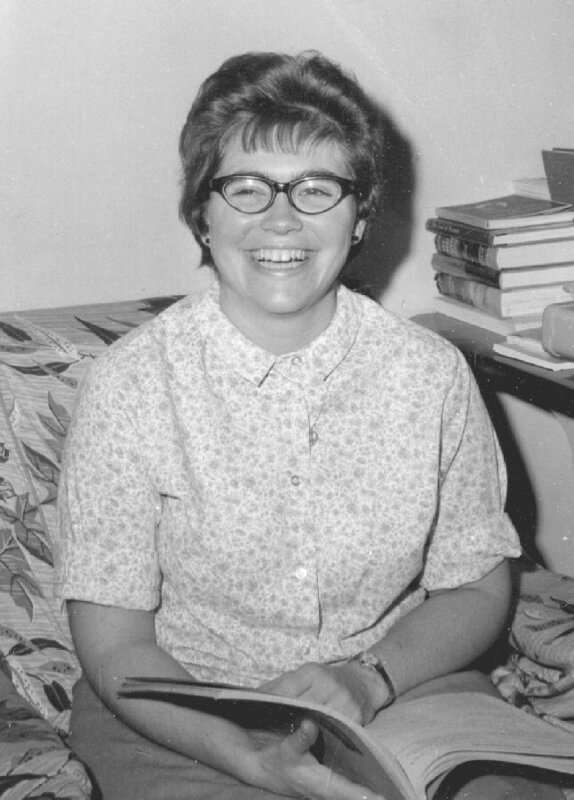 (Left) The fledgling Catholic Nome radio project's first volunteer, Noralee Irvin, in 1966. In her own words, she "slung hash" at a local restaurant, lived as a volunteer, donating all of her income toward the future station's construction. SMOKE GETS IN YOUR ICE: You may have heard about the massive wild fires in Alaska. As this is written, almost three million acres have burned this summer, with 76 fires active. The largest and most troublesome blazes are located about 500 miles east of Nome. Still, we, and most of the KNOM coverage area have endured periods of low visibility because of windborne smoke. THE COUNT: So far this year, KNOM has broadcast about 25,000 inspirational spots, and an equal number of educational ones, thanks to you. Thank you! Thank you for joining us at www.knom.org. If you would like to receive thank you notes via e-mail instead of the Post Office, please mail business manager Lynette Schmidt at knomdevelopment@gmail.com. Thank you! INSPIRATIONAL SPOT: Lord, all too often I end up focusing on my limitations. Please help me to keep what I cannot do from interfering with what I can do. INSPIRATIONAL SPOT: When you were born, you cried and the world rejoiced. Try to live your life so that when it ends, the world will cry and you will rejoice. 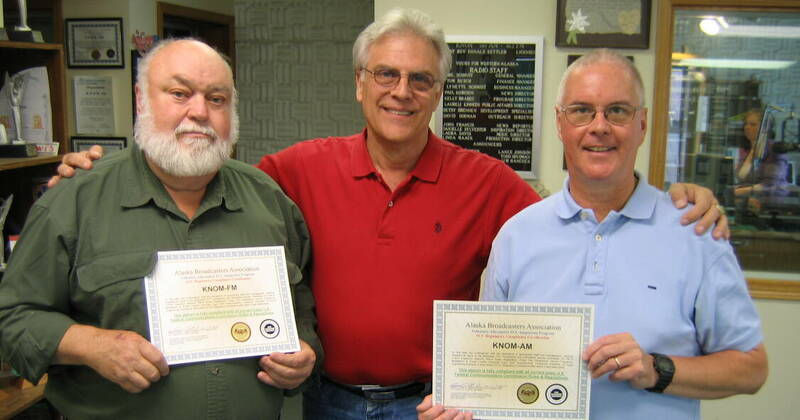 SQUEAKY CLEAN: (left) Alternate Federal Communications Commission inspector Ed Sutton stands between KNOM’s Les Brown, at left, and Tom Busch, who hold KNOM’s new certificates of compliance. Ed spent a full day poring through every aspect of KNOM’s paperwork and technical operation and declared the AM and FM stations to be completely in line with federal regulations. It’s called an alternative inspection, a program which the FCC began several years ago. In the old days, FCC employees would occasionally spot-check stations, and give them cursory once-overs. Today, most stations voluntarily undergo these extremely rigid inspections every three years. Les and Tom, who now live in urban Alaska, were in Nome for the inspection, as well as to continue annual preventive maintenance. 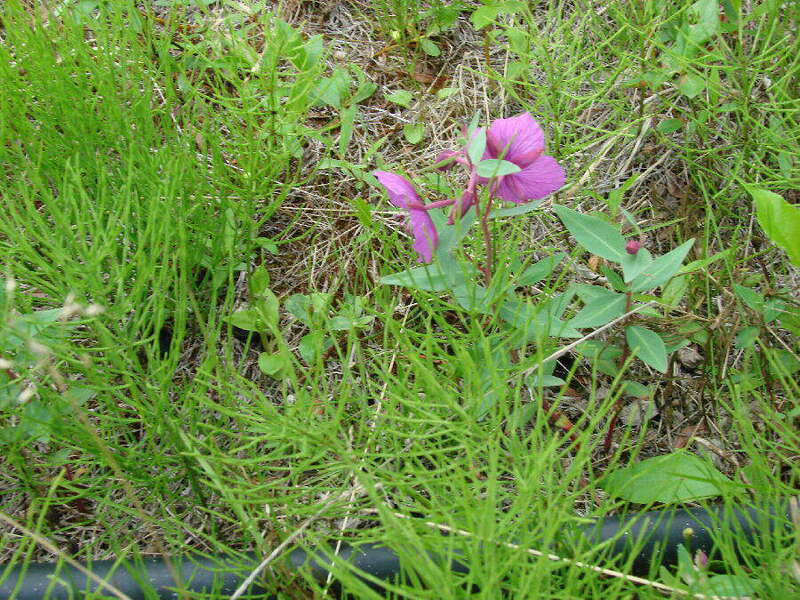 CLINGING TO LIFE (left) A tundra plant blossoms near the base of the KNOM tower. The dark object at the bottom is a transmission line. TWENTY YEARS AGO: The program has run for 23 years. On September 12, 1989, KNOM’s expanded interview show, “In Depth,” sees its final broadcasts at 6:15 PM and 10:15 PM, 18 minutes long, featuring three Army recruiters. It’s replaced the next day by a daily “KNOM Feature” program after the 9 AM and 6 PM newscasts. The new program is eventually renamed “KNOM Profiles,” and continues airing weekdays twenty years later. 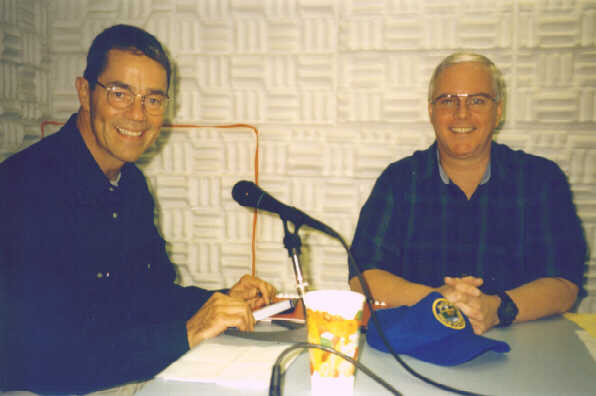 TEN YEARS AGO: (left) September 2, 1999, Alaska governor Tony Knowles, at left, devotes an hour of his time to a live call-in in KNOM Studio C, moderated by general manager Tom Busch. The governor answers questions regarding a recent disastrous reduction of salmon stocks in western Alaska. 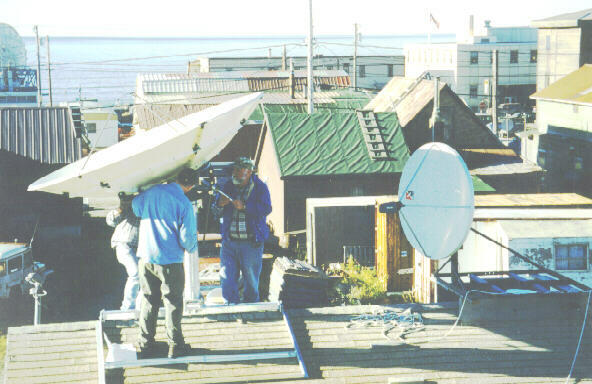 Six days later, chief engineer Les Brown (facing the camera) and two Associated Press technicians hoist a 9-foot satellite dish to the roof of a storage building behind the KNOM studio. The following day, they align it and install a new receiving system for the AP teletype and audio network. Both days, they can only work in the afternoon, after the roof’s ice has melted. ONCE MORE, we pray that Our Almighty Father greatly blesses you. Thank you so very much for keeping strong the oldest Catholic radio station in the United States.